“Eczema” is now a generic term for a variety of benign, non-contagious, usually associated with itching skin lesions. Eczema is the most common skin disease. Eczema express themselves through: redness, flaking, blistering, cracking, and itching. Also called atopic dermatitis or atopic eczema, is by far the most common type of eczema. As “atopic” refer to the physician an inherited predisposition of the people in his life allergies, allergic asthma, hay fever, hives, eczema (atopic dermatitis) to develop. Eczema is an inherited predisposition against dry skin and itching. For the development of atopic dermatitis there is no single cause. Today, however, it is certain that it is a genetic disorder of the skin immune regulation. Skin symptoms include red, scaly, sometimes oozing eczema on the skin and severe itching. The disease progresses in waves and has an individual, dependent on age appearance. Atopic eczema is considered not curable, but is treatable. The therapy consists mainly of the treatment of the characteristic skin dryness and the external use of anti-inflammatory agents. There are other treatment options, their effectiveness must be proved in individual cases. The seborrheic dermatitis often occurs in adults and infants. Malassezia furfur fungus or Pityrosporum Ovale plays a role in the pathogenesis of the disease. In infants it is presented as reddish patches that form plaques. In adults it mainly occurs in areas rich in sebaceous glands such as the scalp (dry skin as seen by the patient), and other common locations are the eyebrows, the sides of the nose, the area of the sternum and back. The rash in these areas shows redness, scaling and does not itch. The exacerbations are usually observed in winter and in times of stress. It appears as red plates in exfoliating on the face, the sides of the nose and above the eyebrows. 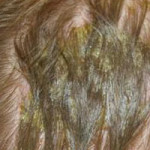 The examination of the hair often reveals sticky scales on the outline of the hair. Sometimes there is a rounded plate in the middle of the sternum. The facial skin is easily irritated. Itching occurs on the scalp. Treatment of seborrhoeic dermatitis with topical corticosteroids is performed locally with immunomodulators (calcineurin inhibitors) and shampoos with antifungal activity. Contact with certain substances can develop into a hypersensitivity or allergic reaction in the form of eczema. If the contact is avoided, the eczema no longer occurs. In this form of eczema inflammation occurs, when and where the skin comes in contact with the substance (allergen). In more severe dermatitis there may be intense pain and inflammation with exudate (liquid). Clinically, during the acute phase itch, irritated skin with swelling and blisters occur. In the subacute phase the bubbles and swelling subside, forming papules, scabs (crusts) and exfoliation. During the chronic phase, where the irritant acts for a long time, longer than 2 months, there is thickening of the skin with accentuation of physiological aspects, dryness, pruritus and hyperpigmentation.There are people that contact with certain substances (hypersensitive Irritant contact dermatitis as the housewife eczema is caused by too much washing hands) or allergic (eg nickel dermatitis) react. Water, detergents, soaps, detergents, antiseptics, building materials, vegetable substances like tomato, onion, oil, acids and many others can cause it. This eczema is curable with simple treatments and thus avoid causing substance usually. At the age decreases elasticity, softness and water retention capacity of the skin. Due to the loss of elastic fibers and the atrophy of the subcutaneous adipose tissue, the skin is thin, limp and easily vulnerable. Environmental factors such as sun exposure, cold, dryness, wrong cosmetics or too frequent washing with inappropriate drugs may accelerate skin aging. Hormones also play a role with the onset of menopause, many women complain about dry skin.